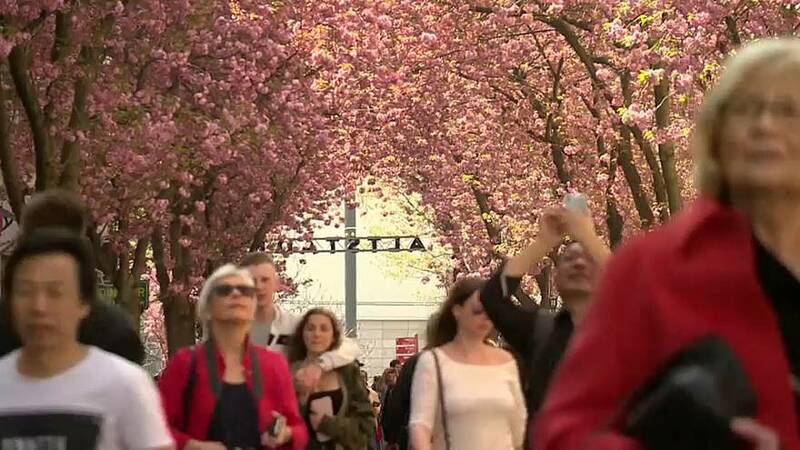 A district of the German city of Bonn has burst into bloom and brought tourists flocking, as the cherry trees lining its walkways create a canopy of pink blossoms. The cherry trees were planted in the late 1980s to bring this once run-down, working class district to life. Now the streets of Heerstraße and Breite Straße have become an annual spectacle. Retired city planner Brigitte Denkel, who was instrumental in the redesign of the area, said that initially the trees were meant to "revitalise" this part of the former capital of pre-unification West Germany for residents, and the tourists they have drawn are a bonus. "We really didn't think that it would become such a splendour, and such a hype," she said. The Japanese Carnation Cherry trees that dominate the Bonn boulevards are known for particularly lush flowers, with the bloom lasting up to two weeks, depending on weather conditions.